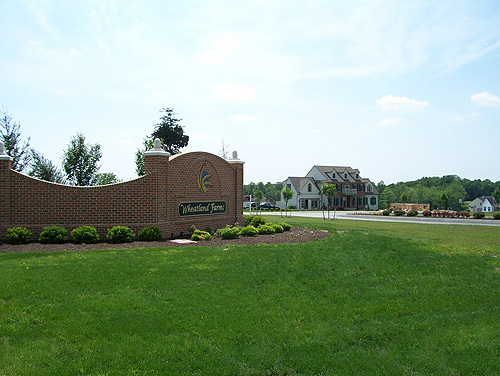 This project is a 143 lot residential subdivision in Chester County, PA being constructed in three phases. The site improvements for Phase 1 are completed. The development is partially encompassed by woodlands and has been enhanced with the construction of segmental block retaining walls. The walls have been designed to provide spacious rear yards with an aesthetically pleasing appearance. Andrews Excavating provided services for Phase 1, including erosion control, site clearing, 140,000 cubic yards of earth moving, 5,200’ of sanitary sewer installation, 5,200 L.F. of storm sewer installation, 4,200 L.F. of on site waterline installation, 6,000 L.F. of offsite waterline installation along State Route 896, 14,000 S.F. of segmental block retaining walls, 6,300 L.F. of concrete curbs, 8,600 S.Y. of paved streets, highway improvements to SR 896, and seeding.